There’s always that moment. That bright second when the world aligns itself into an open path. For Sokha Hester, the path has been both treacherous and remarkable. 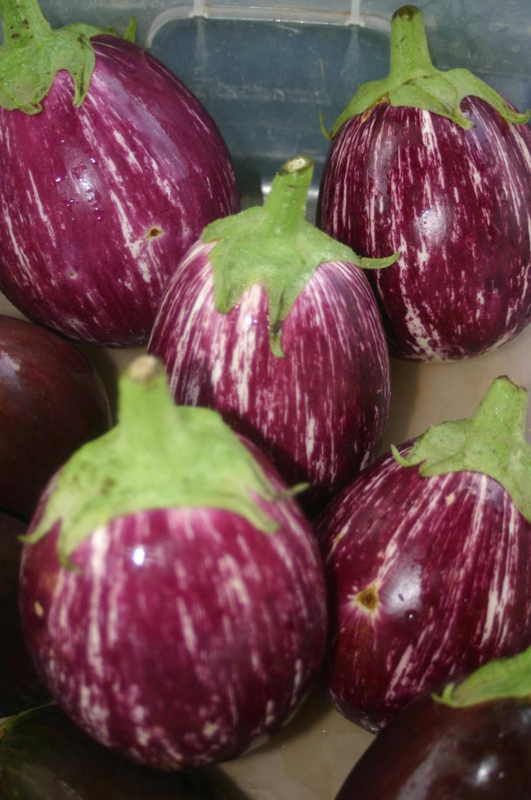 But the moment she started on the path of a professional grower of food happened when she gave a teller at her bank a few of her homegrown eggplant. 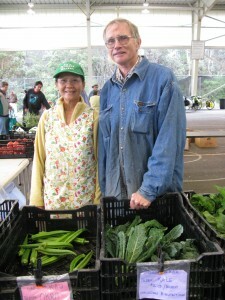 The next week, the same teller begged Sokha to sell some of her harvest at the Na’alehu Farmers Market. You can see why. Anyone who catches a glimpse of anything grown on the Hesters’ farm, blinks twice. Not just beautiful. Stunning. Years later, Sokha and her husband Ellis, have innovated their 30 acre growing space a mile above Pahala, into a farm that offers such a diversity – nothing seems impossible. 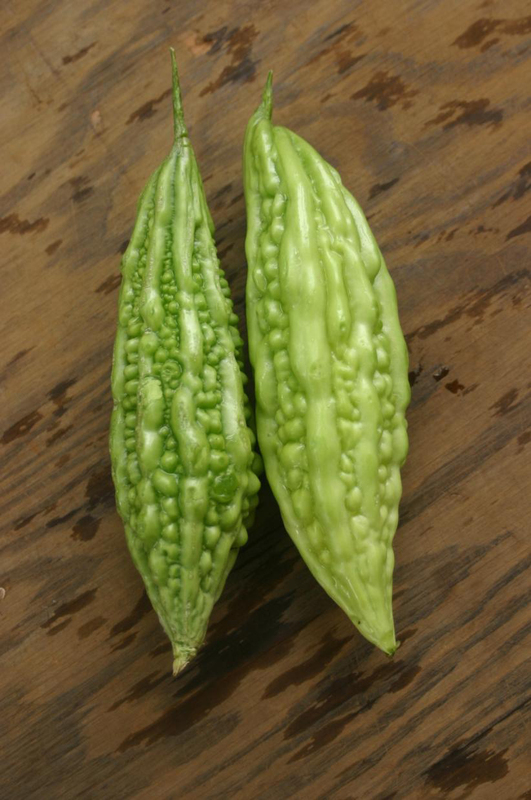 They continue to creatively work their way through a variety of not the best growing conditions: uneven land, rocky soil, weather conditions – to bring to their markets the most flavorful and eye-popping vegetables. As we sat on the beautiful deck of the home she shares with her husband Ellis and their cats, Sokha confides that it hasn’t been easy lately. Ellis had just come through some health issues. She was worried about how long they could keep up such a difficult way of life: waking up early for the farmers markets, the very physicalness of farming, the necessity of their constant brainstorming of solutions for their crops, the long summer twelve hour days. And they are not only providing employment. They are providing an opportunity for learning how to grow and all of the skill set needed to run a farm. The young local people on their farm that day looked involved and engaged, there was a sense of pride to. How can you not feel very good about growing things of beauty. I’m getting repetitious, I know. But, look at this. 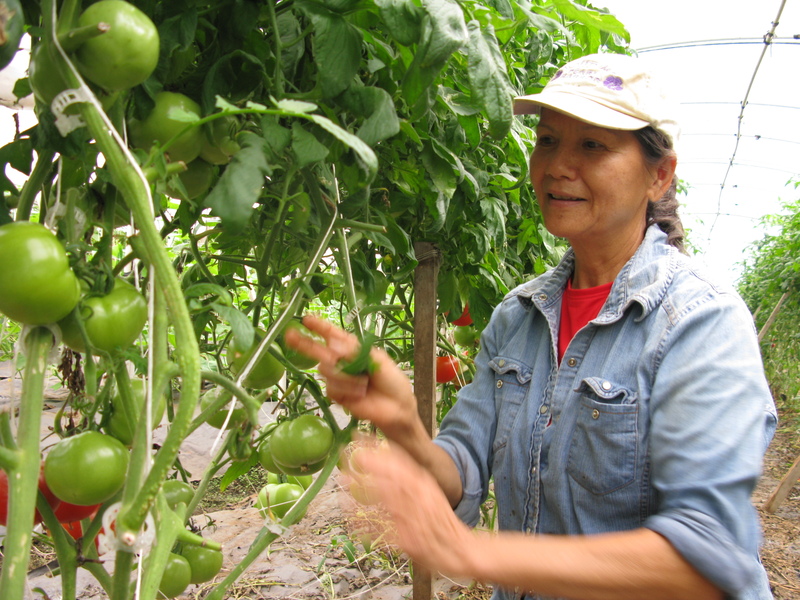 That she came back to growing food is another circle altogether. The beginning of that one took place in a small village in Cambodia decades ago, during the communist regime, where she and her family had been relocated. They, like every family, had been given a 100 square foot space. They, like all the other families during that era in Cambodia, went into the forest to cut trees and grass to build a shelter to sleep in. This is where and how they lived for years, Sokha, her parents, her ex-husband and their four children. She traded seeds with her neighbors and learned how to grow. They are Cambodian, Chinese and Vietnamese. Her family ran businesses, not farms. This was her first experience with growing, in the small spaces around their house. She grew pumpkins, squash, whatever she could. They never got to eat what they grew. Khmer Rouge guards would keep track and come to harvest all produce for the main kitchens. She didn’t mind, as long as it was providing food for people. She kept growing. After her mother died in the camp, they decided that it was too dangerous to stay where they were. It took five attempts, but they all made it out. The path out was through jungle and fields laden with mines. But they made it. They made it to the US where Sokha eventually started working for a technology company that developed high-speed telecommunications equipment for hospitals. Sokha, starting as a technician, worked her way through the gates and ended up as a patent-holding engineer. It was hands on all the way. They would give her the projects that engineers with degrees could not handle. Her love of finding solutions is something she has in common with her husband Ellis, the perennial farmer. They stay up nights devising solutions for their farm. Two inventors burning the midnight oil about water, weather, tractor pumps. After she met Ellis, he was managing a huge organic farm in Willamette Valley. She began spending more and more time in the country, on the farm. He taught her how to drive a tractor. They began coming to Hawaii Island on vacations. They loved being here. And slowly, a way opened for them to move to Ka’u. At first it was natural to tend a vegetable garden. They had no idea it would turn it into a business. But here they are. Thirty acres later. Here she was now. On an island in the middle of the Pacific Ocean. Growing food for people and creating livelihoods too. I am looking to contact the above detailed farm regarding employment. What should I do? A treasure to be sure. You want best, see her for it. We love you Sokha. You fill my soul with hope and my heart with delight…I am a 72-year-old great gramma with a garden and chickens…you younger people are the inspiration that will change Big Island and help it become totally self-sustaining from the fish farms to someday all mainland fruit being grown on the slopes of Mauna Kea!!!! I constantly give away seedlings and encourage the young people to start growing their own food and its so fulfilling when I get a report on that “first tomato” etc. I know this website will inspire many……thank you for all those involved in creating such a lovely place to visit…. 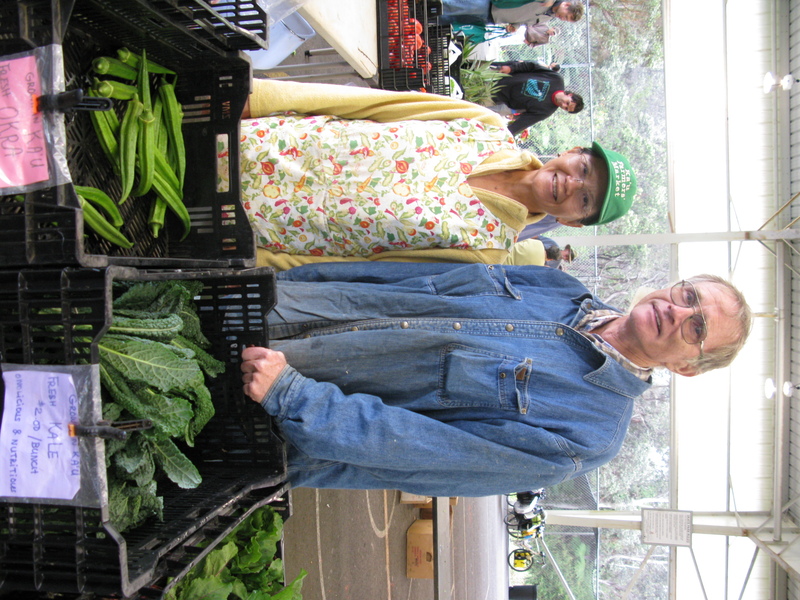 I have been buying many of my fresh veggies from the Hesters for as many years as they have been coming to the Volcano Farmrs MArket. Always fresh NO SPRAYS foods. Always a smiling Sokha. Always a quiet Willis. One year ago I started my first family size organic Veggie GArden in Mt. View…..what a learning curve! I grow for three adults & four very large dogs. FUN….. now we are eating some of our own veggies….& still buying from Sokha as well. I tell her every Sunday….THank You for being a Farmer & coming to the Volcano FArmers MArket. Some times it is VERY COLD & DAMP in Volcano….but…they are still there for us. She Grows Food is a very interesting site. THank you for telling me more about the farmers. Sokha, in my opinion, you are one of Ka’u’s treasures! Thank you for being an inspiration to the people you meet. Sorry for delay in response — I’m forwarding your email and request to the Hesters. Thanks for being part of the food growing community! Hope this works out! Sokha is my oldest aunt on my mom’s side. Looking through the photos of her vegetables and fruits, I wish I was living closer to her. Om (titled for oldest aunt in Khmer)… you are amazing! Your garden is a paradise! Hope one day we get to go and see first hand. I have been missing you at the Volcano Farmers Mkt. on Sundays. I have been told that you are not coming due to the draught. We send you good energy for rain. We miss your very high quailty produce !!!! All of her vegetables are so fresh. They are refrigerated the night before the morning at the farmer’s market. So, pick, wash and straight into a refridgerator, out to the truck, farmer’s market. Quality assurance are the best out of the best. 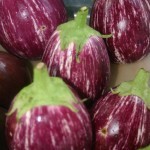 If a zuccini has a tiny bug byte, not good enough.